Surrounded by giant centuries-old trees that populate a spectacular private park, the Four Seasons Hotel welcomes you in Florence. Just a stone’s throw from the hotel there is the heart of the city where discover its artistic and cultural life, its narrow streets, fascinating buildings and enjoy the shopping district and night life. Florence hosts many events and festivals and you easily take part in staying comfortably at the Four Seasons Hotel Firenze. 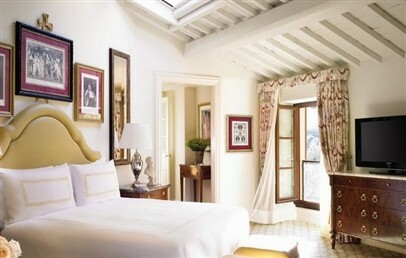 The Four Seasons Hotel Firenze is a luxury property features original frescoes and reliefs of 15th century palace and a 16th century convent. It is also characterized by a perfect blend of elegance and modern technologies. Wide open spaces, high ceilings and a relaxing view of the garden make unique every corner of the hotel: its fine restaurants, Spa, two exclusive meeting rooms dedicated to events and ceremonies, 71 rooms and 45 suites. Immersed in the privacy of the park, there is, finally, the swimming pool with solarium area. The 116 accommodations are located both in the Palazzo della Gherardesca and in the Conventino. The restoration has respected dimensions and original details, so every room of the Four Seasons Hotel Firenze is exclusive, welcoming, spacious and bright. The rooms and the suites provide king size beds, high quality amenities and marble bathrooms. Superior rooms, 39 sqm, view of typical streets or internal courtyard. It consists of double room with living area and desk and can hosts two adults and a cot. 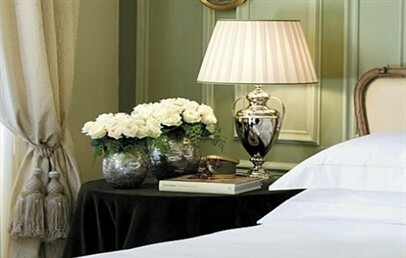 Deluxe room, 43 sqm, view of the street or surrounding of the hotel and garden. It consists of double room with living area and can host two adults and a cot or a rollaway for children. Premiere room, 46 sqm, view of the park, garden or surrounding of the hotel. It consists of double room, living and work area and can hosts three adults or three adults. 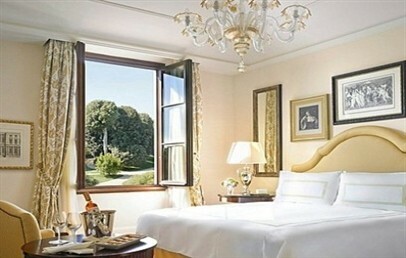 Four Seasons room, 51 sqm, view of the park and garden or surrounding of the hotel. It consists of double room, living and work area and can hosts three adults or two adults and children. Junior Suite, 55 sqm, garden and park view. view of the park, garden or surrounding of the hotel. It consists of double room and separated living and work room and can hosts three adults or two adults and children. Parlor Suite, 60 mq, park view. Junior Suite, 55 sqm, garden and park view. view of the park, garden or surrounding of the hotel. It consists of double room and separated walk-in closet, living or work room. It can hosts three adults or two adults and children. Executive Suite, 65 sqm, panoramic view of the park, Capponi streets and Florentine landscape. It consists of double room and separated living room with sofas and armchairs. It can hosts three adults or two adults and children. Dipped in the garden, the Spa of the Four Seasons Hotel Firenze covers an area of 791 sqm. It consists of 10 treatment rooms, including two double suites, an outdoor pool, Jacuzzi, Turkish bath sauna and fitness centre. It offers body care and relaxing treatments, manicures and pedicures and sources its products from Officina Profumo – Farmaceutica di Santa Maria Novella. The Spa is open daily from 9:00 to 21:00. The fitness centre (205 sqm) provides Technogym equipments and usually offers yoga classes, walk in the park and personalized sessions with expert guidance. It is open daily from 7:00 till 22:00. Morover a outdoor swimming pool is at guests at disposal. Nearby the Hotel it is possible practice golf, tennis and horse riding. The catering service offers a fine dining experience for two reasons: for its elegant restaurants with vaulted ceilings and terraces and for its sublime menu characterized by a modern interpretation of the Italian and Tuscan traditional dishes. The hotel restaurants and bars are available 24 hours a day through In-Room Dining. The Concierge of the Four Seasons Hotel Firenze is at your disposal for suggestions, information and organizing extra activities. Possibility to rent a "Vintage Car" or to enjoy a hot-air balloon tour (on request). The hotel hosts weddings and private ceremonies and will be happy to arrange the whole catering. For children there are fun welcome gift, colouring books, cartoon movies, books and toys. The Hotel provides child-size bathrobes and slippers, complimentary babies’ toiletries, baby sitting service and a free use of stroller, high chair, baby bottles and toys. Tourist tax – 5 Euros per person per overnight, valid for everyone older than 12 years. Double rooms located throughout the Hotel. Welcoming and characterized by warm colours, they consists of a living area with desk. The marble bathroom has a large sink, European soaking tub, crystal box shower, bathrobe, hairdryer and complimentary toiletries. The Superior rooms face the Gino Capponi or Borgo Pinto streets or have a courtyard view. Double rooms located in the Palazzo Della Gherardesca or in the Conventino. Large and elegant, they consists of a fine furnished living area. The marble bathroom has a large sink, European soaking tub, crystal box shower, bathrobe, hairdryer and complimentary toiletries. 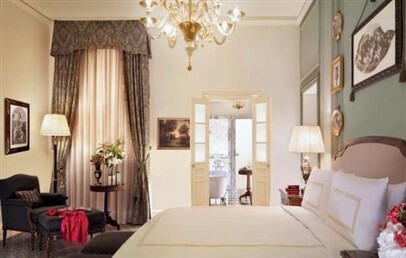 The Deluxe rooms face the nearby streets or the palaces or have a gardens view. Double rooms located in the Palazzo Della Gherardesca or in the Conventino. Bright and characterized by unique and original furniture, they consists of a living area and work area too. The marble bathroom has a large sink, European soaking tub, crystal box shower, bathrobe, hairdryer and complimentary toiletries. The Premiere rooms face the park or the gardens or the nearby residences. Double rooms located in the Palazzo Della Gherardesca or in the Conventino. Elegant and characterized by warm yellow and olive green colours, they consists of a fine furnished living area. The marble bathroom has a large sink, European soaking tub, crystal box shower, bathrobe, hairdryer and complimentary toiletries. 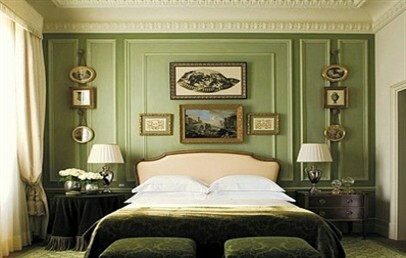 The Four Seasons rooms face the park or the gardens or the nearby residences. Located throughout the Hotel, the Junior Suites are elegant and characterized by warm yellow and olive green colours. They consists of a separated living room or studio. The marble bathroom has a large sink, European soaking tub, crystal box shower, bathrobe, hairdryer and complimentary toiletries. 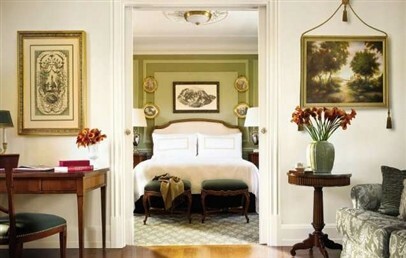 The Four Seasons Junior Suites face the park or the gardens. Located in the Palazzo Della Gherardesca or in the Conventino, the Executive Suites are elegant and characterized by warm yellow and olive green colours. They consists of a separated living room with work area, sofa and armchairs. The marble bathroom has a large sink, European soaking tub, crystal box shower, bathrobe, hairdryer and complimentary toiletries. 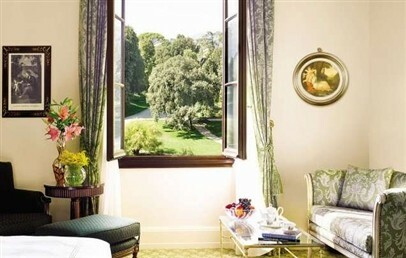 The Executive Suites face the park of the Hotel or the Via Capponi street and the Florentine landascape. Located in the Palazzo Della Gherardesca or in the Conventino, the Parlor Suites are elegant and characterized by warm yellow and olive green colours. They consists of a separated living room and walk-in closet or a open space with living area. The marble bathroom has a large sink, European soaking tub, crystal box shower, bathrobe, hairdryer and complimentary toiletries. The Parlor Suites face the park of the Hotel.